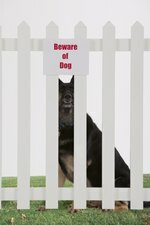 An Invisible Fence is an option for people who wish to let their dog run free but cannot install fencing due to zoning or budget limitations, or simply do not desire a fenced-in yard. Invisible Fences operate via a central transmitter that sends low-level electrical impulses by radio frequency to a receiver attached to the dog's collar. While transmitters and most collars have adjustable frequency controls, some collars come preset. It is important to know how to switch frequencies in case a replacement collar is either set or preset to a different frequency. The following instructions are for the Invisible Fence brand. You may need to consult a manual for other brands of fences, but the principles should apply. Use a screwdriver to remove the protective cover from the back of the central transmitter. Locate a switch labeled sw1. Note the frequency the switch is set at, usually 7K or 10K. Inspect the dog collar to determine if the radio frequency is preset or adjustable. This information may be on the receiver face or you may need to consult the instruction manual. If you do not have a manual, remove the transmitter cover and look for a switch labeled sw1. If you find the frequency switch, note the setting and ensure setting options are identical to the central receiver. Set the radio frequency so both the central transmitter and receiver match. Change frequencies by flipping the switch up for 10K and down for 7K. Replace the transmitter covers.